Here is another more editorial or non-traditional portrait of a bride. By using tulle spread on the floor, we add some movement to an otherwise static scene. Side lighting showcases the texture of her dress, which is the clear intent that the wedding dress designer had when creating it. The substitution of a Key for a bouquet in her hands suggests a deeper significance than the classic bridal bouquet would. Perhaps, she holds the key to her heart, which she is willingly giving away. Or perhaps, the metaphor for her key is a recognition of unlocking the full potential of who she will become. The key is not her identity, but merely a narrative piece left open to interpretation. By its intentional inclusion, however, it does become more interesting to observe as is the photo. Watch the video of our wedding gown shoot at Bass Hall in Ft. Worth, TX. 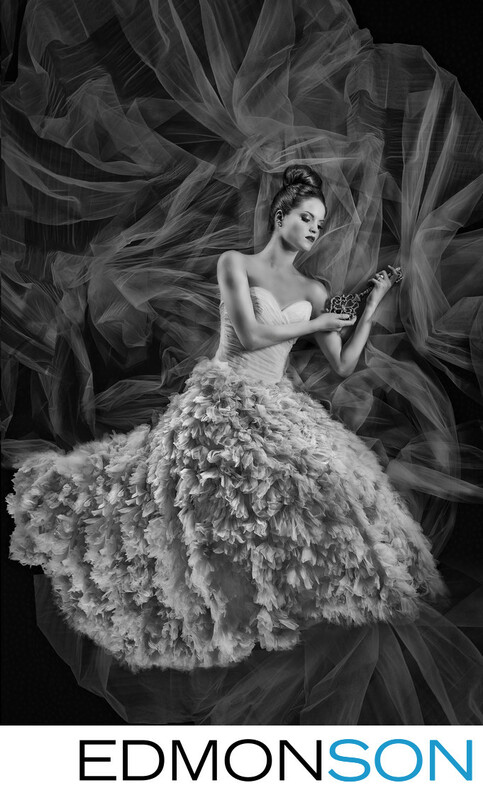 "Prima Ballerina" was a feature for the Brides of North Texas 2012 Spring/Summer issue and is accented by members of the Texas Ballet Theatre. The beautiful model is the former Miss Oklahoma Lauren Lundeen represented by Brink Model Management. Behind the scenes video of the shoot is provided courtesy of one of our recommended vendors, Hakim Sons Films in Dallas. Bliss Bridal Salon provided couture wedding gowns along with Stardust Celebrations, The Bride’s Room, Bridal Boutique, De Ma Fille, The Blushing Bride, and Patsy’s Bridal Boutique. Makeup artist provided by Faces by Angela and another of our recommended vendors for Hair, Sonia Trevino. The wedding bouquets and flowers as seen in the video are from Lush Couture and the jewelry from Kubes Jewelers. See the finished work in our press / published gallery.